Dscoop Edge Orlando. Turning Ideas into Reality. The event, according to show organizers, caters to the needs of HP Graphic Arts users. 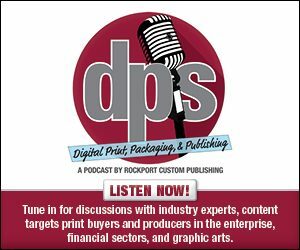 Sessions are defined by print service providers (PSPs) and industry partners who know first-hand the challenges and opportunities printers and operators face. This year’s theme, “Turning Ideas into Reality,” highlights PSPs that create and deliver amazing work for clients. Focus areas of the event include Edge-Ucation, Networking, and Cutting-Edge Technology. Dscoop Edge Orlando brings together players in the digital print ecosystem, delivering practical, relevant tools, training, applications, and collaboration to help PSPs maximize technology and equipment investments and stretch the boundaries of digital print. Above: Sappi showcases McCoy, Opus, and Flo Digital papers for HP Indigo. Educational sessions are a cornerstone of Dscoop conferences. The Edge-Ucation program—designed by Dscoop’s PSP-led education committee—ensures that the knowledge and skills training garnered at the event is immediately applicable. Valuable documentation and how-to guides are included, enabling attendees to re-create what they learn when they’re on the job. Two highly business-focused sessions are new to the agenda. Networking is another essential component of the Dscoop organization. Attendees have consistently given Dscoop’s networking opportunities top marks for expanding professional networks, building industry relationships, and creating more business through joint endeavors. In addition, the Solutions Showcase at Dscoop Edge Orlando spotlights HP Indigo technology, partner solutions, and applications driving greater innovation, productivity, and growth. Keynote speakers at Dscoop Edge Orlando include Chris Barez-Brown, founder of Upping Your Elvis. Barez-Brown shows attendees how to enhance personal creativity to create organizations that are more innovative, more “human,” and drive better bottom-line results. Kristen Hadeed, founder/CEO, Student Maid, discusses how organizations can create a culture that empowers people to be the best version of themselves. Johnny Earle, founder, Johnny Cupcake, shares how to create loyalty and obsession for your products, your business, and within your teams through social media and experiential branding. One important aspect of the Dscoop Edge Orlando conference is networking opportunities. While these take place throughout the entire event, the Solutions Showcase provides a place where PSPs are able to interact with key companies to help push their business forward. Here, we offer a look at what to expect from Dscoop partners. acpo ltd. highlights its overlaminates for the label printing and flexible packaging industry. APS Imaging Solutions features two advanced Photostory systems that easily add another layer of business to any size digital lab. APS demonstrates its high-speed Automatica VP book block binding machine for the production of luxury quality, lay-flat photobooks and the automated Migliorquadro canvas framing system. Avanti showcases the benefits of its Slingshot Print MIS and HP Print OS integration. The company demonstrates the power and ease of bi-directional job data flow between Avanti Slingshot and HP Print OS. Dscoop attendees experience the potential of this production workflow first hand. From the event floor, they witness real-time job profitability calculations from an actual production on a HP press. Visitors are invited to join Avanti in Zone A at booth 142 at Dscoop Edge. Duplo USA showcases value-added applications with spot coating, texturing, and tactile effects in booth 159. Applications are embellished on the DDC-810 Raised Spot UV Coater or DFL-500 Dry Coat/Foil/Laminator then finished on the DC-746 Integrated folding System or UD-300 Rotary Die Cutter. Esko highlights its workflow automation solution. Automation Engine is Esko’s workflow server that automates prepress tasks and accelerates the packaging and label production process. Esko’s Automation Engine reduces the need for manual operator intervention to a minimum and thus increases uptime and effectiveness of printing presses. Supporting both conventional and digital print technologies, one single production workflow feeds all presses. GPA is surfacing change within the Dscoop community, and introduces the next step in its evolution with new branding and resources. With a redesigned trade show experience and tools including a new website, swatchbook, brochure, and catalogs, GPA aims to inspire loyal clients and engage new partnerships. In booth 121 at Dscoop Edge Orlando, visitors see a range of samples and hear from Highcon users about how digital finishing has impacted business growth. Don’t miss the Highcon Customer Panel, Transforming Digital Finishing into Business Growth, which takes place Monday, March 25th from 2:15 to 3:00 p.m.
Karlville highlights its Pack Ready Laminator for HP Indigo. The product is designed to deliver high-quality laminates for immediate pouch converting with a safe and easy lamination solution, opening new market opportunities for digitally printed flexible packaging. The company recently announced the establishment of its Pack Ready Lamination Film Validation Center out of its Miami, FL headquarters. MBO America focuses on finishing offerings for digital cutsheet and web solutions to cover cut and stack, letter folding, book blocks, stitched books, die cutting, unwinders, rewinders, and dynamic perforating and scoring. PressWise by SmartSoft demonstrates ways in which integration is the PressWise focus, with enhanced integrations for Aleyant Pressero, PrinterPresence, and PrintNow web to print (W2P) storefronts, including tools for setup. Additionally, mail processing with NCOALink is now easier with integrated Electronic Process Acknowledgement Form Management. Other exciting new features previewed last Fall are also released, including Multi-invoice Payment and Accounting Codes. Rollem International features live demonstrations of two Insignia die cutting machines showing ease of operation and quick changeovers to produce die cut products. Whether it’s folded cartons, promotional items, or stickers—Insignia provides a solution. Additionally, visitors are invited to see the Jetstream slit/score/perforation model complete accurate business card, postcard, and brochure finishing. Sappi delivers coated digital papers. The brightest, whitest sheet—McCoy for HP Indigo—delivers a luxurious experience. Opus for HP Indigo caters to the depth and breadth of campaigns. Flo Digital delivers at a practical price. Standard Finishing Systems presents a range of automated post-press solutions. Taking center stage is the Standard Horizon BQ-480 Perfect Binder, featuring a quick set-up and changeover for variable book production, especially for books of one. With interchangeable PUR and EVA glue tanks, the binder also offers advanced automation through a movable, color touchscreen including adjustments for roller height, nipping height, and amount of side glue. Additionally, The SmartSlitter, an all-in-one smart sheet processing system that slits, gutter cuts, edge trims, cross cuts, perforates, and creases in a single pass, is shown. The RD-4055 Rotary Die Cutter is also displayed, producing a variety of unique applications including door hangers, pop-up business cards, stickers, labels, and pocket folders. The CRF-362 Creaser/Folder demonstrates creasing and folding of digital color output in one pass, with no cracking. swissQprint large format printers are everything but ordinary. Whether your focus is versatility, productivity, or both combined, there is a printer to match your ambitions. Dscoop Edge Orlando attendees are encouraged to find out how swissQprint technology produces at the highest quality level—sustainably and profitably, too. Find Tekra in booth 603 highlighting its portfolio, which contains films for HP Indigo, UV, latex, and solvent inkjet printers. The company constantly works to expand with a variety of sizes and specialty items. Attendees are encouraged to visit Tekra and check out the company’s new Dura-Go Protek Velvet Texture Hardcoated Polyester. Tharstern delivers two presentations during the Dscoop Edge Orlando conference. Keith McMurtrie, CEO, Tharstern, talks about automation culture within print businesses. Susan Moore, VP of sales, Tharstern, presents the importance of customer experience. The company exhibits in booth 420 of the Solutions Showcase, demonstrating its Digital Batch Tool and the MIS’ ability to integrate with Hubspot and HP Smartstream. Therm-O-Type features a range of products including NSF foil stamping; embossing and die cutting presses; inline waste stripping attachments; Zip-A3E, CSCL, and TS2L digital finishing machines; RAS-mc right angle slitter; RDC-Flex rotary die cutter; Foil-Tech foil fusing models; and the New Glue-Tech sheet-to-sheet gluer. Stop by booth 631 at Dscoop Edge Orlando to learn more. As digital printing and SKU proliferation grow exponentially, reliance on human decision-making for increasingly complex short-run planning and imposition becomes unsustainable. At Dscoop Edge Orlando, Tyler Thompson of Tilia Labs presents on how the company leverages artificial intelligence technology to drive a revolution in preproduction, helping digital print providers print more, print smarter, and print profitably. Attendees have the chance to see the new generation of Ultimate Impostrip 2019. Visit Ultimate TechnoGraphics in the Solution Showcase to find out more about the imposition and finishing automation software provider. Team members are on hand to show visitors how to optimize print productivity by bringing speed, flexibility, and automation to HP Indigo customers worldwide. XMPie demonstrates its full software platform, including StoreFlow W2P featuring full integration with HP PrintOS. Attendees learn how to leverage data to create personalized omni-channel customer experiences to offer an online experience for customizing and producing short-run packaging jobs, and connect packages to digital touchpoints to add value in this traditionally print-only field.